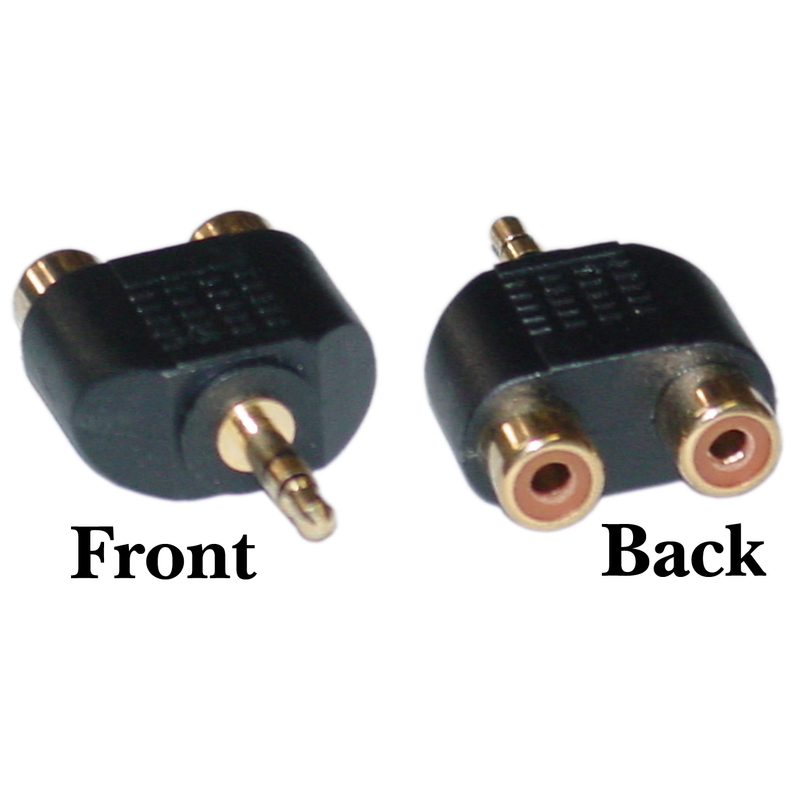 This adapter will convert a 3.5mm headphone-style input into the left/right double RCA connection. This is a stereo to dual RCA audio adapter. I'm using this on a Coby portable DVD player to connect from DVD to TV for audio (RCA red and white plugs). The cables th come with it always short out. Bought new ones on Amazon it was $12 ea. Found this and it was less then $5 shipped with tax for this and 3.5mm Mono Male to RCA Female adapter Part#: 30S1-12200. Here's the link to the DVD player for more information - http://www.newegg.com/Product/Product.aspx?Item=N82E16882136139 Here's the link for the other part for the video http://www.cablewholesale.com/products/audio-video-products/audio-video/product-30s1-12200.php Of course to connect you'll need another cable http://www.cablewholesale.com/products/audio-video-products/audio-video-cables/product-10r1-03103.php But I have a ton of these laying around. Works great and the price is also great. The RCA jacks *are not* red & white. Both are a mustard yellow color. RCA to Stereo adapter works great and you wont find a better price or service. I got this product as a solution without a problem. I didn't need it but I figured get it, it's cheap and I know it'll come in handy. Good product. The product functions properly; however, I wish the left/right channels were color coded in some way. Great price. Excellent shipping time.